The ''performance edition'' of the popular Zillion™—sleek and fast, ultra-strong, smooth as glass, and sporting the latest innovations from Japan. Behind that rich black finish with red highlights is a low-profile baitcaster that handles light baits and heavy fish with equal ease. Zillion Type R's specific upgrades include: 11 super-high-grade Hyper Speed ball bearings supporting the Hyper Speed 7.3:1 retrieve plus an Infinite Anti-Reverse roller bearing; ultra-smooth helical-cut gears; Ultimate Tournament carbon drag with nearly double the drag power; a full Carbon Swept Handle. "Quality reel no doubt, but $399! $130 more for a few more upgrades?!? 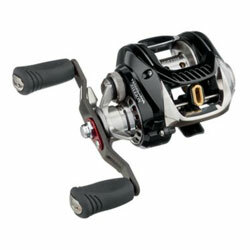 sounds like Daiwa just wants to have a $399 reel like shimano. My advice is to just get a zillion @ $269, even though it was better buy at $249"